Successfully Added LED T8 Tubes for Energy Savings (12-Pack) to your Shopping Cart. Welcome to the 21st century of lighting with these LED T8 Tubes for Energy Savings to Replace Fluorescent Tubes (12-Pack). 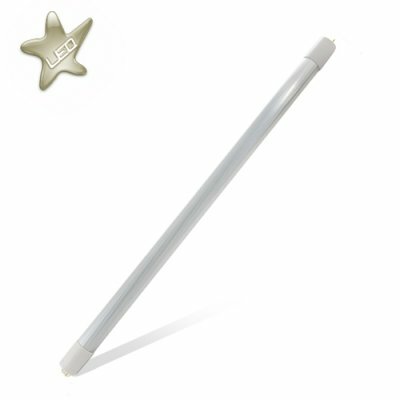 White LED light tube for use as a replacement for standard 2 foot long fluorescent T8 tubes. This 12 watt tube produces an ultra-bright white color of light and makes an economical and environmentally friendly replacement of the fluorescent lamps in any standard 2 foot long (600mm) light fixture. These professionally designed LED light bulbs (often called an LED lamp in the trade) fits into a standard bi-pin fluorescent lamp socket. These are extra bright 12 watt versions that are a 1-for-1 replacement of the tubes you have in your office or home. Our solid-state T8 LED light tubes will save you anywhere between $30-$50 a year each in energy costs while giving you a similar amount of illumination to what your old fluorescent tubes are providing. So in an existing 3 lamp fixture, replacing the 3 fluorescent tubes with these LED tubes will save you $100+ per year! In addition, with a life rating 3x that of a fluorescent tube, this LED tube will cut down on your maintenance costs and headaches. Now just imagine if you replaced the tubes in just a few rooms of your small business or home with these LED's, you could potentially save yourself hundreds of dollars a year!! Great for retrofitting into existing lighting fixtures in offices, kitchens, bathrooms, hallways, garages, utility rooms, or just about anywhere that is currently using fluorescent tubes. These white LED light tubes deliver smooth and uniform light perfect that is for any room in your home or business. Give yourself the quality (and energy efficient!) lighting you deserve with these 2' LED light tubes. Chinavasion offers this model LED tube light in a China Wholesale Price 12-Pack so you can maximize the savings and convenience of this revolutionary energy saving LED product. These specification grade Chinavasion LED lamps come with our famous 12-month satisfaction warranty and are available with a factory-direct China Wholesale Price that you cannot find anywhere else. Upgrade to LED lighting today and enjoy the savings for years to come!